Just a bit of info - climbed Hugo's Horror Revisisted yesterday. The top anchor could use all the sun bleached tat cut off and replaced. As it was I cut one of my alpine draws and added fresh to it. More important the third belay anchor / second rap anchor is not equalized for raps. My partner rapped first and you're essentially weighting the top right bolt which under load was wiggling quite a bit. Under no load it seemed tight. If someone goes up I'd at least bring something to tighten which may do the trick - if not it should be better equalized. No pics but it's got quick links and rings that just don't "match" to equalize when the rope is threaded. totally agree with all that. you can read what I thought in this week's Report. I also mentioned it to Jon Sykes. I traversed from that anchor over right to the Space Time anchor. I didn't have any spare sling/webbing with me. I also thought one of the hangers was loose. it would be better if it had ring hangers. as for the lower anchor, it has some screw links that aren't actually even. why the bolts aren't straight I don't understand. at the least what there should be is some chain so you can equalize the load. When I read your your report it was very ironic you mentioned the tat and your rope pic was of the un-equalized rap station! Dave, I believe that in Al's report he mentioned that they first pulled the wrong rope; therefore I believe that the knot started to pull through the ring (looks like one of those old style rolled aluminum rings which should be replaced when proper length chains are added), leaving the tails still through the ring. Probably a good thing as it might have been a bigger problem if the knot and tails had completely pulled through the ring before they pulled down on the purple rope. I was talking about 2 different rap stations. the tat was on the one at the top. IMNSHO it's a mess and should be cleared. it would be great if there were ring hangers on it. the picture was of the one below the top one and it's the one where we pulled the wrong end of the rope and the knot pulled THROUGH the ring! I have very skinny ropes and that's probably how that happened. I don't know why those bolts were placed at an angle. the rock looks just fine straight across from either bolt. go figure. I don't know why those bolts were placed at an angle. the rock looks just fine straight across from either bolt. I'm no expert on placing fixed anchors but I will say I prefer either level bolts placed 10-12 inches apart or vertically like the last anchor on Rapid Transit... that anchor is quite unique isn't it? that anchor is quite unique isn't it? RTFM proveideing the rock is good the actual specs for most wedge bolts call for them to be placed 10X the diamater of the hole apart or about 3" for a 3/8th inch hole. I like to go about 6 in apart in good solid stone. farther apart twists the hangers and the rope. Though I have usually been partial to horizontal placements, vertical anchor placements have some benefits in certain situations. I go with horizontal since I like the way you can slap 2 quickdraws on if you need to set up a TR and you have slightly more wiggle room at the anchor. Hugo's Horror: We climbed it yesterday, equipped to solve some of the above mentioned anchor problems. We were a rope of three, and due to "child pick up" responsibilities, the third ( who had the pack with the chain links, wrenches, etc) had to rap off after 2 pitches to get home in time for the pick up, so the only improvement we could make was to cut all the "tat" off the top anchor, leaving just the dyneema "alpine draw" material left as mentioned by markvnh in the original post. We did as Al H did and climbed to the better ring anchors of Space Time Continuum about 20 feet right and 6 feet higher to make our first rappel. As mentioned, our friend with the gear pack has every intention of going back up soon to "make things right" but for now the top anchor is less than ideal and since it was so easy to avoid using it, that's what we did! The anchor at the top of the 3rd pitch, as Al already discussed, is also much less than ideal; we were initially equipped to make that better as well but didn't remember until the gear pack was 350 feet below us . Senior moments!! In Al's photo where the rap rope partially pulled through the ring, you can see that the ring is one of the old rolled aluminum ones; I wish people would stop using those cheap things on established routes! 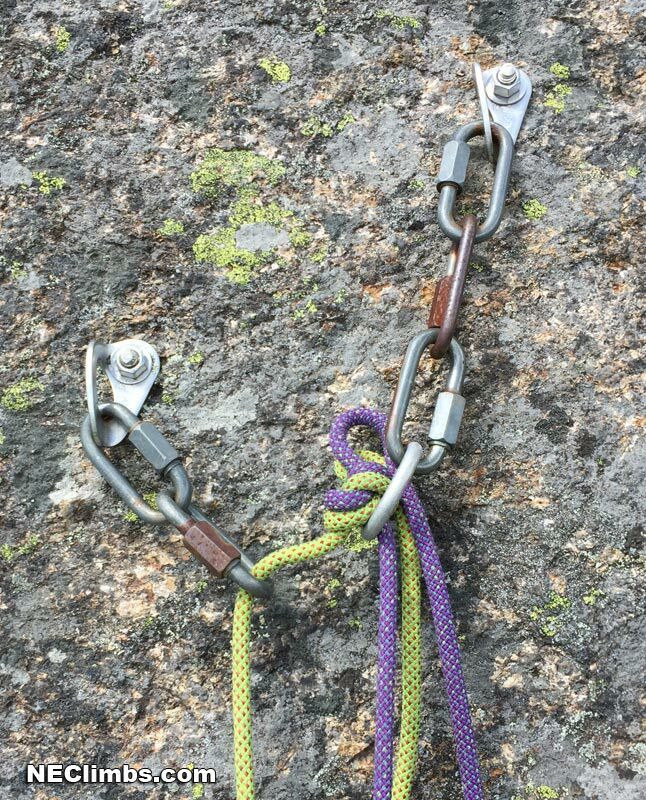 I have certainly carried them with extra sling material in the mountains for emergency use, but they have NO PLACE on popular routes with fixed bolted anchors.